Client Journey Map is a visual representation of the client experience from the perspective of the client. This is different from the process map, which focuses on internal processes of the company. For instance, there may be multiple internal hand-offs but the client does not see them, instead the client may be experiencing delay waiting for the processes to be complete. This may not be seen on the process map as all internal units complete tasks within their service level agreements (SLA). 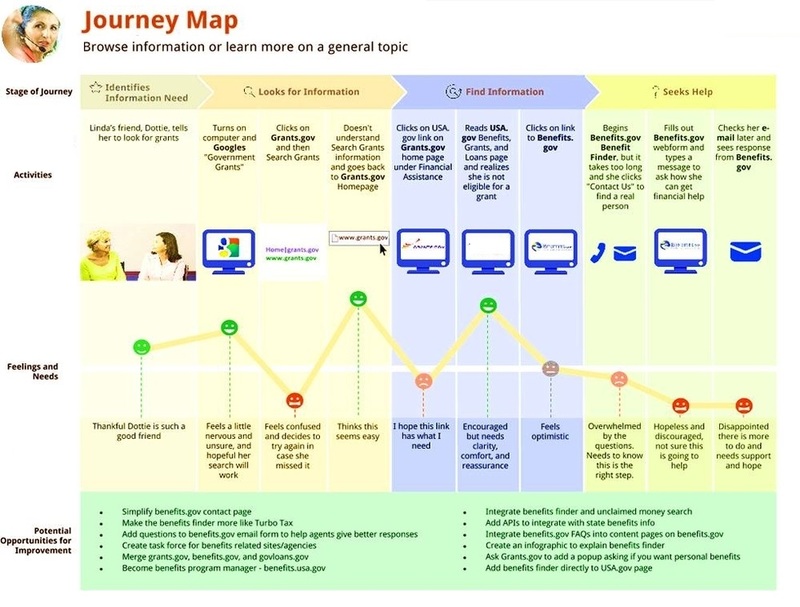 The key parts of the client journey map include the high level process, activities undertaken by the client, client’s emotional state or a feeling s/he is experiencing in each of the stages, channel of interaction and recommendations for improvement mapped against each client stages of the process. Client journeys are best completed leveraging client interviews, client complaints, surveys or experience of employees using the service. They offer unique alternative view of client’s activities and emotions related to the process.